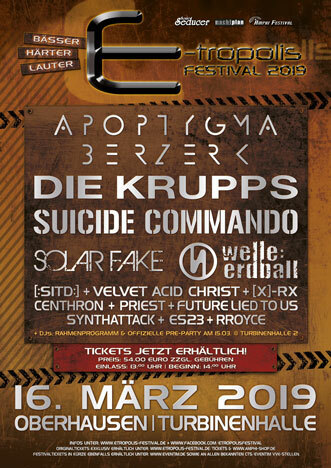 E-tropolis 2019 – Спасибо Oberhausen! С финальными аккордами Apoptygma Berzerk в этом году фестиваль E-Tropolis подходит к концу. И хотя вечеринка будет продолжаться до самого утра, самое время поблагодарить всех вас за прекрасную атмосферу и аншлаговый дом с более чем 4000 посетителей! Поделитесь с нами вашими лучшими впечатлениями и фотографиями на Facebook и в нашем новом профиле в Instagram: @etropolisfest at # etrop19! Предварительные продажи на 2020 год начнутся завтра – в понедельник, 18.03.19, на сайте www.amphi-shop.de и во всех известных местах CTS / Eventim VVK с первыми группами COVENANT, DIORAMA, SOLITARY EXPERIMENTS, GRENDEL, EISFABRIK, WINTERKÄLTE, TORUL и RUINED CONFLICT! 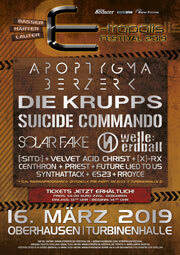 This official "E-tropolis Festival" web presence in Russia, Ukraine, Belarus and other CIS countries is run and published by Ukrainian Gothic Portal (www.gothic.com.ua) by courtesy of Amphi Festival GmbH, Osteriede 5, 30827 Garbsen, Germany. The Amphi Festival GmbH, yet has no influence whatsoever on the information of this web site and accepts no guaranty for its correctness. The content of third-party sites, linked on this website are the responsibility of the respective owners/providers. At the time third-party web sites were linked to this site, Ukrainian Gothic Portal found NO GROUNDS WHATSOEVER of any likely contravention of the law. Ukrainian Gothic Portal shall promptly delete a link upon becoming aware that it violates the law.